More of my Fox In Flats style dare outfits from September, as well as the first time I've shared two of my latest purchases. 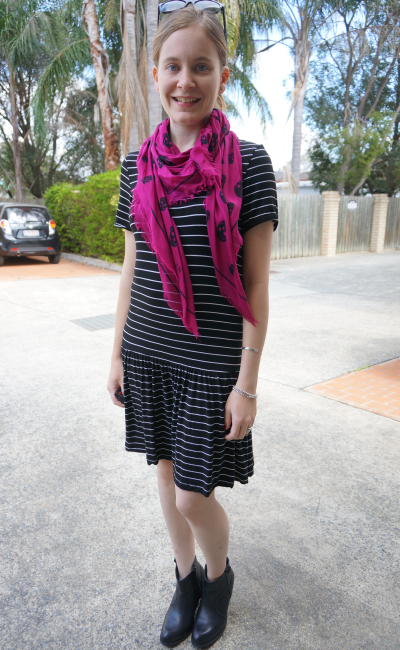 First time I've worn this cute striped dress from my September purchases. Thought it would be a nice thing to wear to go out to lunch with the boys (DH, Baby T and Cooper). It was a little cooler, so I added ankle boots to keep my feet warm. The style dare for the day was 'LBD', so this dress worked nicely. This is my first drop waist piece. I know that the trend has been around for a while now, but I was never sure how it would look on me. Being petite, I didn't want it making me look shorter than I am! Decided to try this dress from The Iconic as I had a discount code for 50% off and they have free returns if it didn't work out. While it is a different style for me, I really like it. The fact that the dress is so stretchy and comfortable helped make my mind up on it too! Last worn: Ray-Ban Wayfarer, skull scarf, Asos ankle boots. First time I've worn the dress. Although this is the first time I've worn this tank on the blog, it's not the first time I've worn it. Just didn't have the opportunity to take a photo the first time around. I was looking forward to wearing it again and getting the time to take a photo! The Fox in Flats Style Dare challenge for the day was bright, so I just picked a nice bright statement necklace instead of going for a bright outfit. The tank has a slightly boxy fit with a little ruffle hem, so it's great for disguising the left over baby belly! Sadly it doesn't look as great with maxi skirts as I had hoped, maybe if it was just a little shorter (or I was a little taller!). Luckily, it is really nice with jeans. I wore it with jeans previously too, but really liked it this time with the bright statement necklace against the black. Was a nice casual comfortable outfit for a BBQ lunch with family, and my necklace survived baby T's grabby hands, which was wonderful. I'm slowly getting around to wearing my necklaces again, as baby starts to get more control of his hands and grabs things for a reason and less haphazardly. I was so scared of him getting tangled in my necklaces before. You worry about the weirdest things with a baby! Last worn: yellow sunnies, skinny jeans, mouse flats. First time I've worn the tank on the blog. Linking up with Let It Shine, Style to Inspire, Mix It Mondays, More Pieces of Me, Real Mum Style, Style Sessions, Confident Twosday today. Really love the drop waist dress on you! Oh I love these ankle boots you wore in the first picture! You are looking so thin! I love that drop waist dress paired with the booties. So chic. I lOVE your dropped stripe dress! I love the flare fit of the bottom, so cute!!! Super cute looks! I love the second one -- especially that necklace! 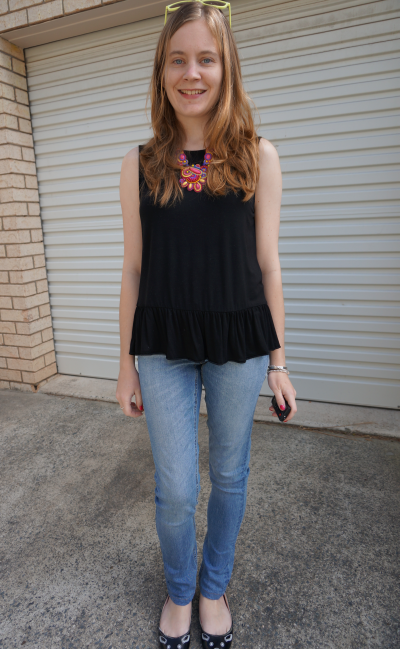 I love this simple black top pairing with the statement necklace and leaving the rest of the outfit simple and clean! Both of these looks are absolutely adorable on you! I love the drop waist dress! I think your drop waist dress suits your figure, you look great in navy and the stripes are so on trend. I like the way your bright coloured sunnies and necklace stand out against the dark. You look great! I think the drop waist looks really cute on you and doesn't shorten you at all! Really like the peplum top and the dress is perfect for a lunch date! Being petite myself, I totally feel you on the dropwaist trend. I find that finding the right length is key. And I absolutely adore that top in the second outfit!! So beautiful on you! I am so jealous how well you pull off the drop waist style! I cannot, for the life of me, look good in that cut. But you look fantastic! I fall in love with your mouse flats each and every time. I am really drawn to the dropped waist dress, I have also wondered how the trend would look on me. It think the dress looks completely perfect on you. Both are great outfits - love the pop of pink with the scarf in the first one. I love the second look! It's so cute and adorable :) And I think the ankle boots work very well with the dropped waist dress. The second look is definitely my fave. Mica I have been seeing more and more drop waist dresses these days - I think yours was a great buy - it looks really good. I can imagine it worn with so many things ! That is a really nice twist on a striped dress. I love the hem of it. Really sassy! I LOVE that peplum top on you Mica! You should wear more peplums. Looks so cute on you. Looks great with those jeans. Your new dress is adorable on you! It's so fun when you try out new styles and they work out! Super cute striped dress! I like it paired with the ankle boots!